Hundreds of people showed up within the first couple hours of the estate sale for industrial designer and artist Viktor Schreckengost on Friday, the first day of the three day sale, at his Stillman Road home in Cleveland Heights, Ohio. When I arrived in the first hour, there was a mob of people waiting outside and I was instructed to get number. I got number 153, and they had just called 74, so it turned out I had a couple hour wait ahead of me! Viktor Schreckengost’s house and estate sale in Cleveland Heights, Ohio, June 24, 2016. Once inside, the house was full from basement to attic of personal household items of the Schreckengosts, Viktor and his wife Gene. It was an incredible feeling just to be in his house, and on the grounds. I left with a few small items that I thought were interesting, and learned by someone at the sale and a member of a Viktor Schreckengost Facebook group that he most likely designed a couple of them. Creamer designed by Viktor Schreckengost. One item being a plain coffee cup and creamer he designed for Salem pottery with no design. The other being his popular Christmas pattern showing a decorated tree with gifts under it. A pedal car and pedal plane ornaments made good additions to my holiday decorations. I thought a partial metal sign with his initials, V.S., may have been from a childhood toy. Miniature solid colored dishes that he designed but had produced to give as holiday gifts, and I bought five to have. A few small plates were most likely salad plate designs by Vik. Miniature dishes designed for production by Viktor Schreckengost. There was a room in the house where Viktor had hundreds of seashells and rocks, separated in different boxes, containers and cans. 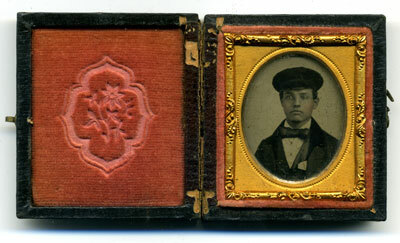 A few of the shell collections were in old cigarette boxes, Marlboro and Viceroy. I thought this was a clever way organize them, using boxes and containers from around the house! Sea shells stored in an empty cigarette box belonging to Viktor Schreckengost. 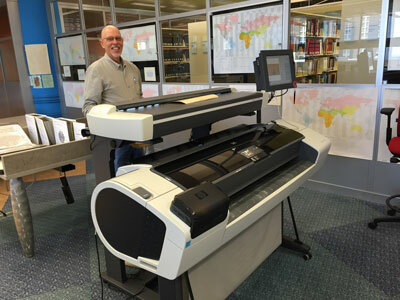 It was a well-organized and fun event (by Mitchell Attenson Estate Sales), to see what purchases others were walking out with, like a globe, candlesticks, and plate designed by Viktor, a steel yard stick, a teapot, and even a Pantone book! 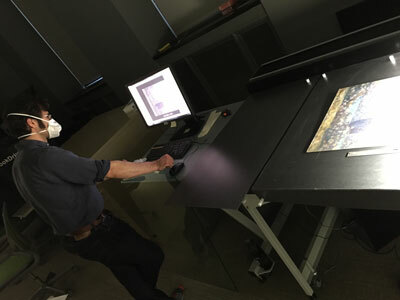 Viktor Schreckengost estate sale, June 2016. Christmas ashtray with artwork designed by Viktor Schreckengost. 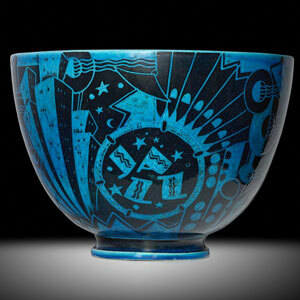 Cup designed by Viktor Schreckengost. Salad plates designed by Viktor Schreckengost. 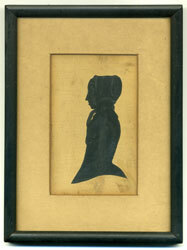 Metal sign piece with Viktor Schreckengost’s initials. Pedal car Christmas ornaments designed after actual pedal cars by Viktor Schreckengost. Pedal car and plane (reproductions) designed by Viktor Schreckengost. Shells, rocks and organic objects in boxes and containers in the attic of Viktor Schreckengost. 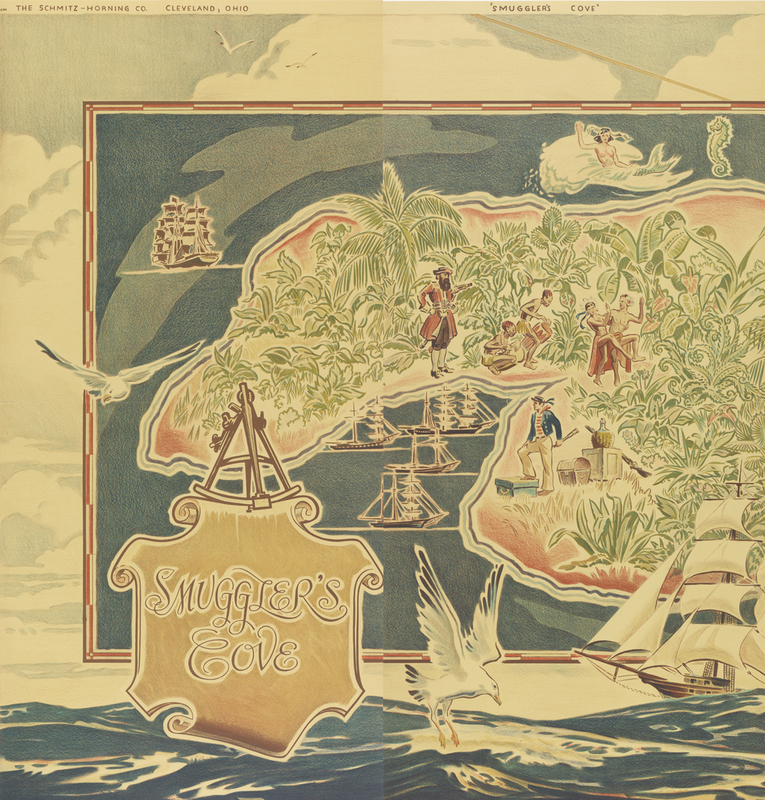 Painted poster in the home of Viktor Schreckengost. 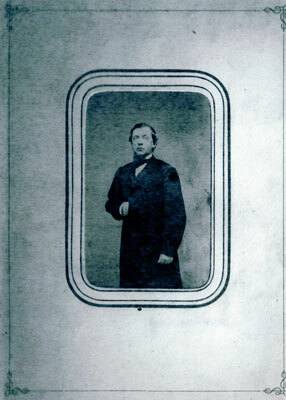 Books belonging to Viktor Schreckengost. Travel souvenirs and miscellaneous art and objects in the home of Viktor Schreckengost. It’s here, the restored Euclid Beach Carousel! 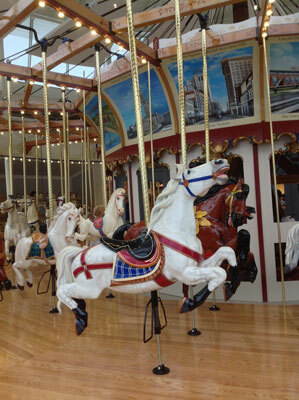 The time has almost come for the restored Euclid Beach Park Grand Carousel to open to the public, on Sunday, November 23, 2014, at the Western Reserve Historical Society. I have been watching the progress, first by working for Cleveland antiques expert Terry Kovel for four years at her antiques and collectibles information publishing company, as she served as Chairperson of Cleveland’s Euclid Beach Park Carousel Society, bringing the project idea to light and dutifully following through on the fundraising and building of it. 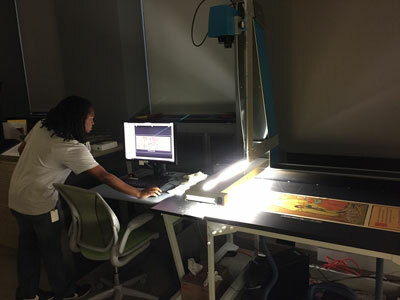 The idea originated from her late husband, Ralph Kovel (Board Member at WRHS), who wished to restore it to working condition at the Historical Society’s museum. 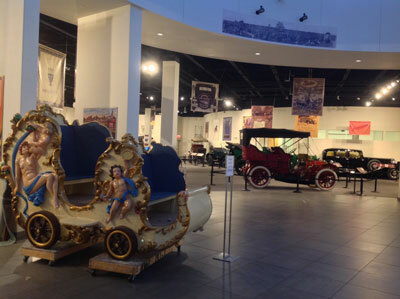 And, secondly, by visiting the museum to see the horses on display while fundraising events were going on, and to witness the progress of carousel being built. Being inspired by the Carousel and event enabled me to create and bring art items to sell in the gift shop there: carousel and Cleveland-themed note cards, prints, and gift bags. The workmanship, quality and aesthetic beauty of the Carousel are incredible. Horses over 100 years old were carved in wood and brightly painted. 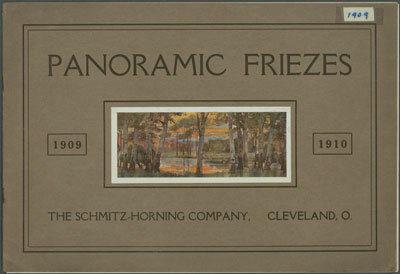 Hand-painted oils of Cleveland scenes adorn the upper part of the inner structure. 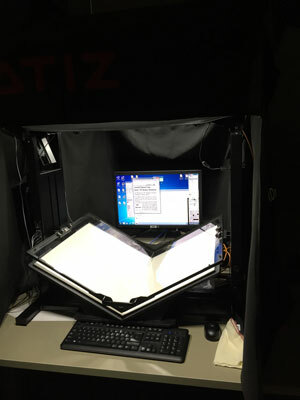 It was restored, built and installed by Carousel Works of Mansfield, Ohio. 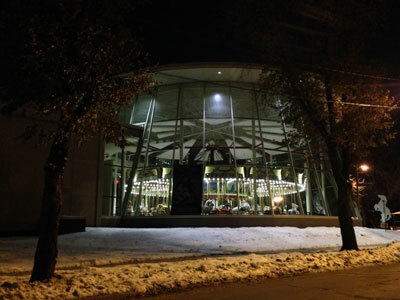 A glass jewel box pavilion was built in front of the museum to house it, and the Carousel turns slowly and lights up the sky at night. Euclid Beach Park: Cleveland’s playground for 75 years. Terry Kovel of the Cleveland Euclid Beach Park Carousel Society has fond memories of the park. 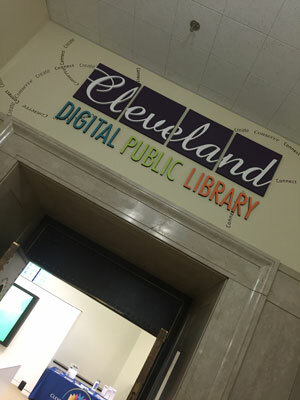 Western Reserve Historical Society, Cleveland, Ohio. Jewel-box carousel building. Carousel chariot awaits installation for The Grand Euclid Beach Carousel at the Western Reserve Historical Society, amongst antique cars regularly on display. 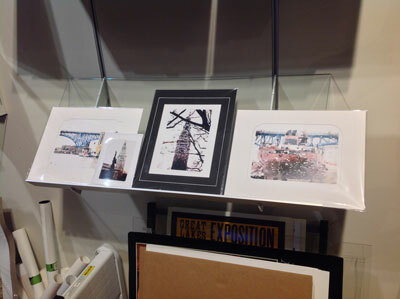 Cleveland prints by Janet Dodrill at the WRHS gift shop. 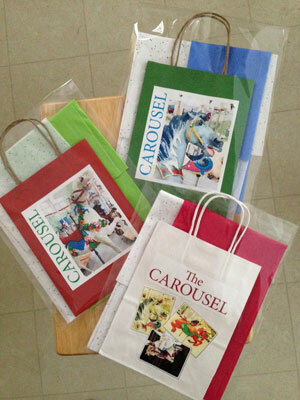 Carousel gift bags by Janet Dodrill at the WRHS gift shop. 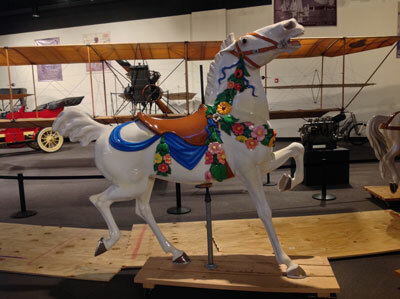 A beautiful hand-carved, painted antique carousel horse awaits installation, near a historic plane and automobile. 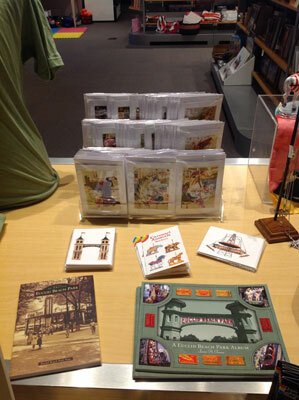 Carousel note cards available at the Western Reserve Historical Society gift shop, by Janet Dodrill. 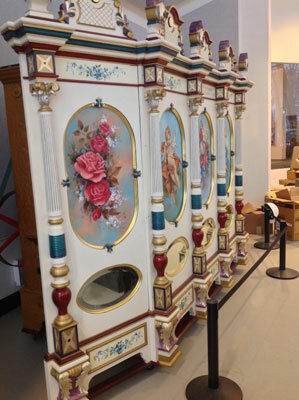 Original Euclid Beach Park Carousel pipe organ, with hand-painted decorations. A workman’s hard hat hangs on the gate. 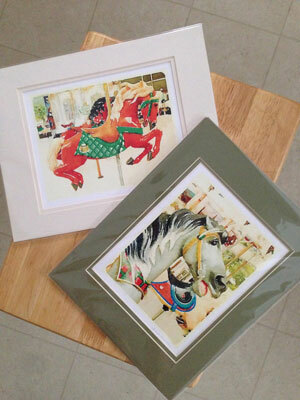 Carousel prints by Janet Dodrill for sell at the WRHS museum gift shop. 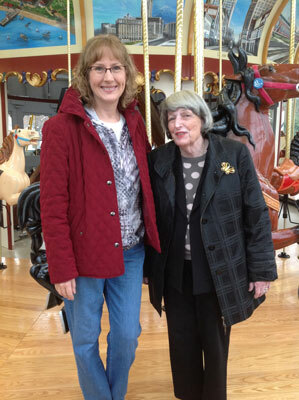 Janet Dodrill with Terry Kovel (Cleveland antiques expert and Chairperson of Cleveland’s Euclid Beach Park Carousel Society) visiting the carousel construction in progress at the Western Reserve Historical Society. 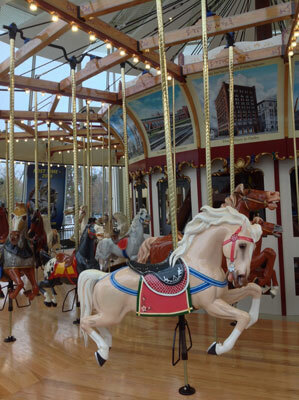 Carousel horses and other pieces come together in the restoration project of the Euclid Beach Park Carousel.